I have become a firm believer in celebrating life’s little wins. There’s nothing like a bottle of sparkling wine to transform a Thursday night from the final day in the weekend countdown into an evening worthy of savoring. Depending on on how many people you’ve invited to your personal pop-up party, you may wind up with some leftover less-than-bubbly. After all, this is a weekday indulgence – and waking up with a brick on your forehead would pretty much defeat the purpose. So rather than pour that extra glitter (that one’s for you, @itsamich!) to waste, why not use that last bit of liquid gold to elevate your next meal with effortless elegance? 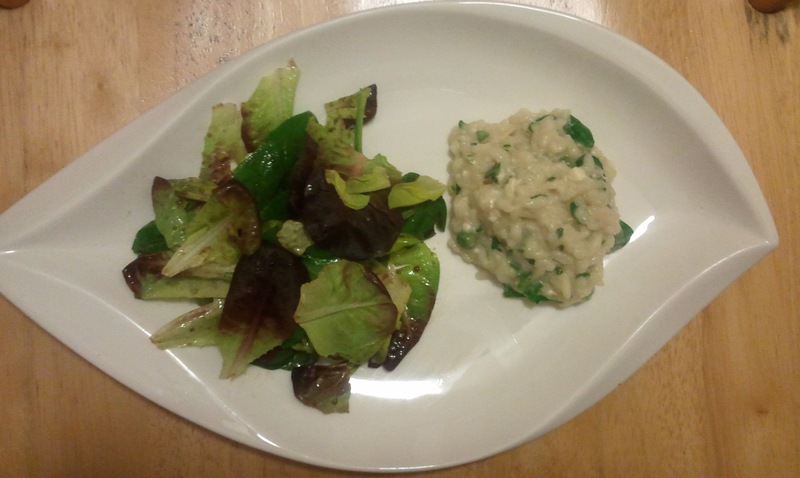 Wanting to capture the richness of celebratory flavor without decimating any semblance of virtuosity – and yes, also having just dropped a $20 on a lusciously extravagant non-neccesity – I decided to make a champagne risotto so as to make going the meat-free route easy. I consulted Cooking Light, which I’ve come to rely on as a resource for expert shortcuts to lighten up heavy favorites, where I found a basic recipe from which I gave myself the freedom to improvise. The recipe uses feta cheese to provide the risotto’s requisite creaminess, reserving the parm as a topping, where it will leave a lingering taste impact for minimal calories. As I hovered over my stovetop leisurely laboring over this notorious attention-hog of a classic, I was viscerally struck with a memory of my first attempt at risotto. 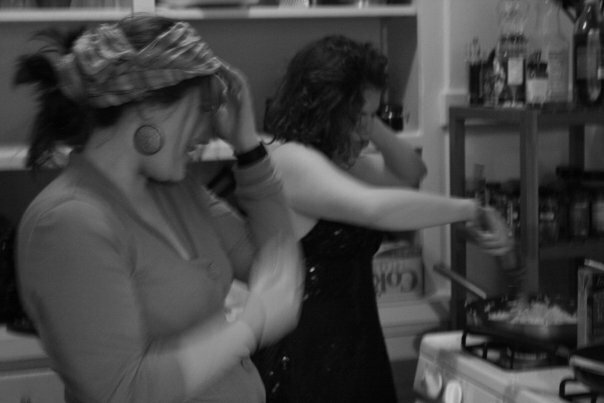 Now the stuff of culinary legend amongst my beautiful and amazing roommates of the time, it’s pretty incredible to think back on that Sunday evening almost four years ago when to cook what I thought was the ultimate in classy family dinner I donned a sparkly thriftstore dress and secondhand heels, dumped some stuff in a nonstick sautee pan over very barely there heat, and an hour later served raw rice to my nearest dearest. 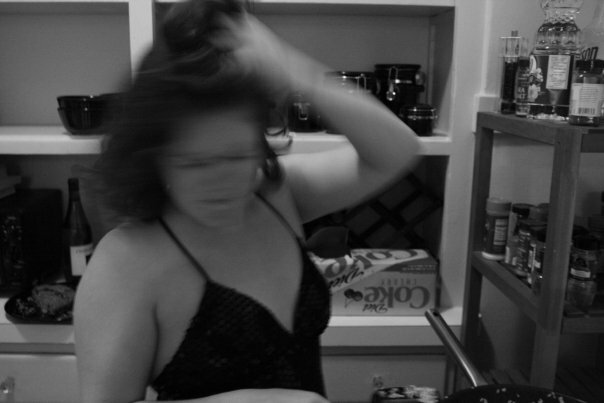 Some things never change - I've always been prone to the kitchen dance party. While I can’t say I do much Sunday afternoon “menu planning” while throwing back Baileys’ at the Gold Cane these days, I guess it’s not quite fair to say I’ve just discovered the value of turning the ordinary into the revelatory. Four years and a dozen or so risottos later, it just looks – and thankfully, tastes – more than a little different. Where would we be without Facebook? Spring 2008. 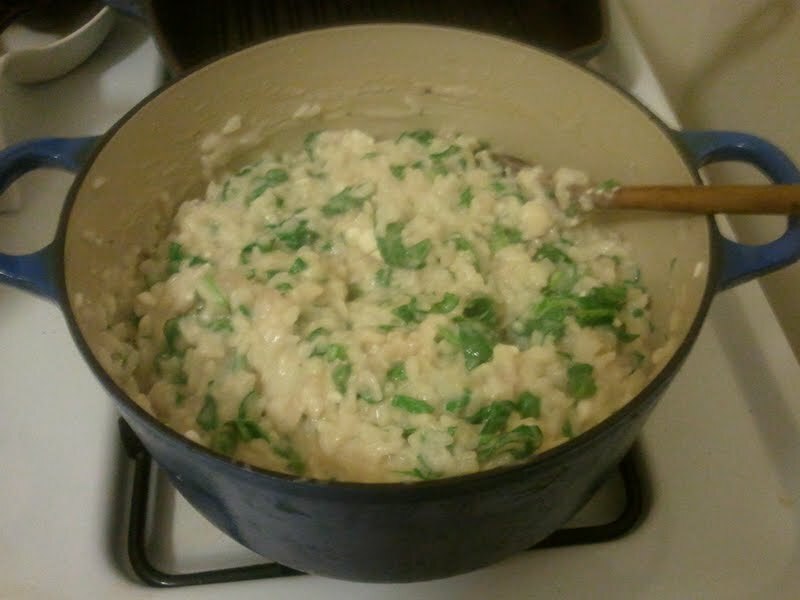 *Adapted from Cooking Light’s Champagne-Feta Risotto; I also doubled the recipe so we would have leftovers. The champagne and the feta infuse this rich dish with a tanginess perfectly cut by interlaced sweet peas and economically bulked up with some spinach. *Quality Control Note: While it doesn’t matter so much for the cooking, do yourself right when you’re toasting you. You don’t have to break out the Veuve, but please don’t defeat the purpose and settle for Andres – I find Mumm Napa, a few steps up from Cook’s, a solid compromise. Combine the chicken broth, the herb and some of the champagne (you’ll want to save 3/4 – 1 cup, so just use whatever else you have – you can also add some white wine if you have an open bottle), along with a cup or so of water, in a pot. Bring to a low, steady simmer (don’t boil). Heat the olive oil in a dutch oven (ideally, you want something ceramic or with a pretty thick bottom. tee hee.) over medium-high heat. When it’s hot, sautee the shallots for a couple of minutes. Add the rice and toast for a couple minutes, stirring so that each baby grain gets some heat loving. Pour the champagne over the rice. Enjoy the hiss. Stir until it has been completely soaked up. When it has, add a cup of the simmering broth. Repeat. Just keep on repeating and, as Marcella Hazan my Italian demigoddess advises, start tasting after about 15 minutes. When it’s just about done – which is when the rice is still a bit chewy and toothsome but resting within a fluffy cloud of soft deliciousness – rinse your frozen peas under warm water for a minute, shake them dry, and add them. Stir in and cook for another minute. Add the feta and stir well. Add the chopped spinach and stir well. Top each portion with grated parm cheese and serve alongside a simple green salad (I just did balsamic, olive oil and fresh lemon juice). Nothing quite matches the affection we home cooks feel for a food once we’ve conquered it. Conquering is very different than mastering, which I would imagine comes with its own satisfaction but isn’t something I’ll feign to know much about at this point in my culinary career (because I don’t think adding pumpkin spice to the Mr. Coffee counts, though it does make for a damn tasty travel mug on your morning commute). Conquering a food involves taking whatever steps necessary, be they imaginative, embarrassing or downright ugly, to transform a once-mystifying ingredient into something not only delicious, but decidedly different than your typical mealtime routine. I feel this surge of fondness everytime I see butternut squash, its chalky yellow coat tucking in the rich orange flesh with its sweet, cara-mellow flavor. My first battle with the butternut occurred on a Tuesday night at Project Open Hand, an amazing SF-based organization that makes, serves and delivers meals to seniors and the chronically ill. Founded in the early 80’s out of one woman’s kitchen to serve AIDS patients receiving no support (or even recognition of their disease) from the government or their families, and whose chosen families more often than not tragically found themselves in the same position, the group operates largely on the strength of its kitchen volunteer base. While I learned a ton about the community in which I live and my neighbors of all ages and walks of life during the year in which I spent every Tuesday night slicing, dicing and packing whatever slid my way across the Polk Street kitchen’s steel industrial counters, one of the most tangible lessons I is how to wrestle a squash into submission. Believe me, once you’ve determinedly hacked your way through 75 of these bulbous little buggers, you know it’s really love. I still don’t understand how those with Jedi knife skills manage to slice them neatly lengthwise. The best I can do is cut off the top and bottom nubs, slice across the base of its neck, and whack into whatever pieces I can from there. I find peelers do little on the tough skin except increase the chances of peeling your own, so I just slice off chunks of the skin piece by piece. This leaves you with beautiful building blocks of rich gold shaped more like what you typically find in a first-grade classroom than you do in a kitchen. Scoop out the seeds and you now you have the pieces to make hundreds of varying dishes using this agreeable $1 starch as a centerpiece. Most of mine seem to start by cutting it into small chunks, tossing with olive oil, thyme, salt and pepper and roasting on baking sheets in a 400 degree oven until soft and just sweet, usually anywhere from 15 – 35 minutes depending on size of your cubes. It's kind of like seasonal baby food for adults on a budget. You can make any number of simple soups without much planning, or with just a little, one my favorite recipes, Risotto with Butternut Squash, Jack Cheese & Pancetta from Cooking Light (check it out as much for the Dutch oven baked risotto trick, immeasurably simple than the notoriously laborious traditional stove-top method, as for the fact that the gooey cheese, crispy pancetta and creamy squash combo is beyond delicious). But you know what? I have mastered something, damnit. The delicious weekday pasta, complete in the time it takes the water to boil and the easiest way to use whatever’s on its way out in your fridge, that’s always ten times more satisfying (and no doubt healthier) than anything a Ragu can will produce. Here’s one recent Meatless Monday edition. 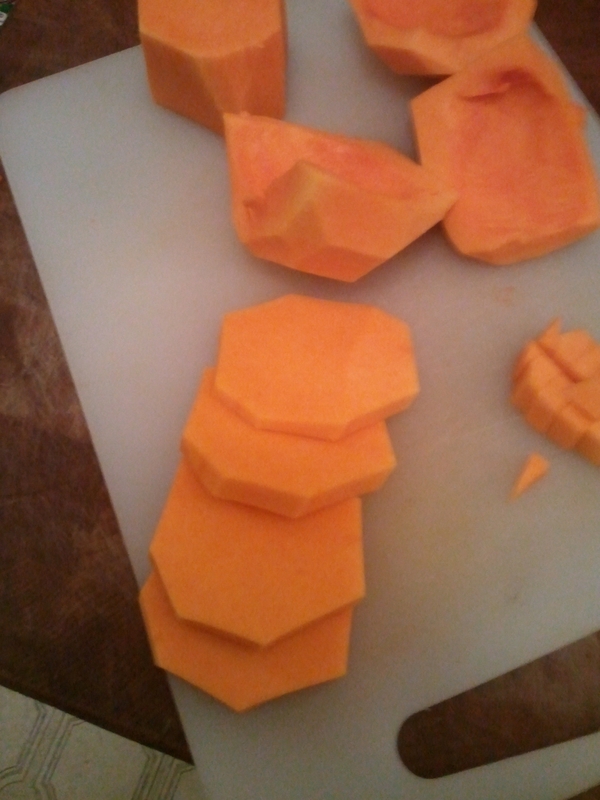 Butternut squash, obv. For enough pasta for 2 plus lunch leftovers, I used about half of 1 squash, saving the rest of the roasted cubes to add to salads for lunch for the week. Boil salted water. Add pasta when that’s happened. Quash that squash. 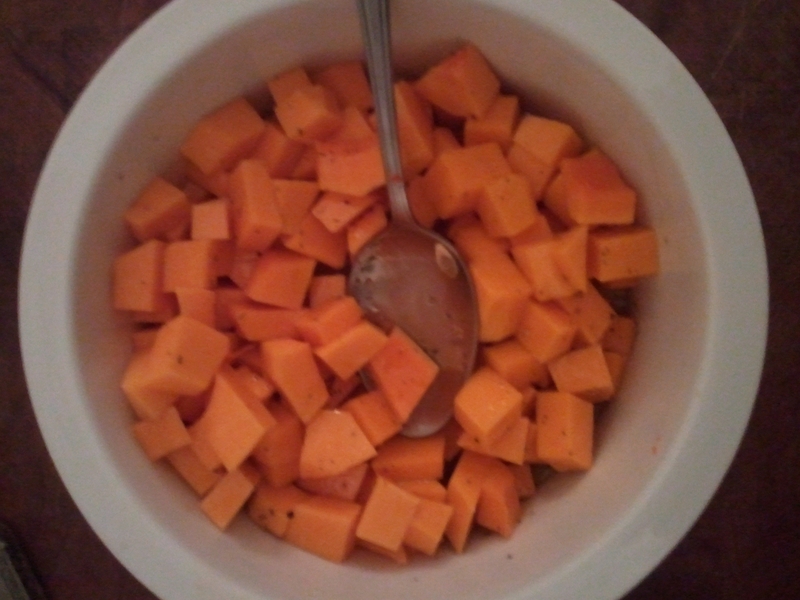 Prep squash as above – cube, toss with olive soil, thyme, s/p and bake on a parchment or tin-foil lined tray at 400 until just soft, 15 – 25 minutes. Sautee away. Heat olive oil, add shallots, stir a bit for a couple minutes. Add garlic, let just brown. Add mushrooms, sprinkle on nutmeg, and let them sweat out their water. Toss in a splash of wine and reduce. Mix it. Drain the pasta when it’s done, reserving a splash of the cooking water. Add pasta back to pot with the splash of cooking water, stirring over low heat until combined. Season. 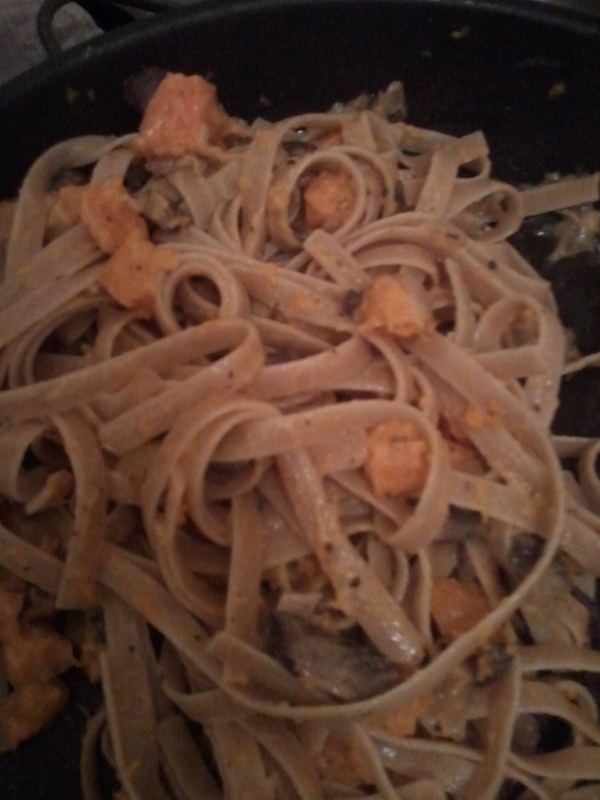 Top with salt ( if necessary), plenty of fresh ground black pepper (always necessary) and grated cheese, if you have it. Check SurfTheChannel.com to see if there’s a new Gossip Girl. What else are Mondays good for?